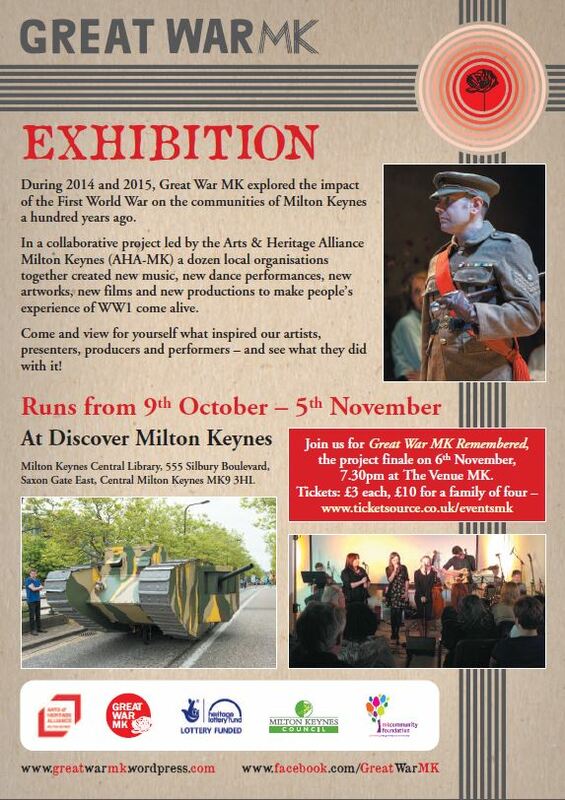 Take a look at the Great War MK exhibition up at The Discover Milton Keynes Showcase in Central Library. Avaiable to view from now until 5th November, when it will move to The Venue MK for the final project showcase (tickets: £3 and £10 – www.ticketsource.com/eventsmk) on 6th November. The Great War produced a lasting legacy of momentous military and political decisions that have rightly entered into the history books, but it is from the local papers of the time that we can gain a truly intimate insight into the impact of World War One on ordinary lives. 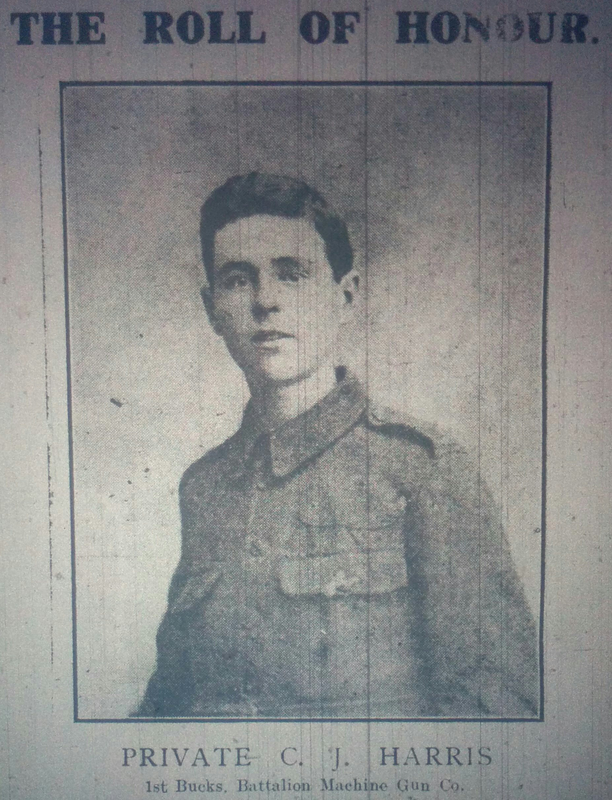 No community was spared the heartbreak of receiving word from the front of fallen soldiers, and local newspapers were a crucial source of this news and information. 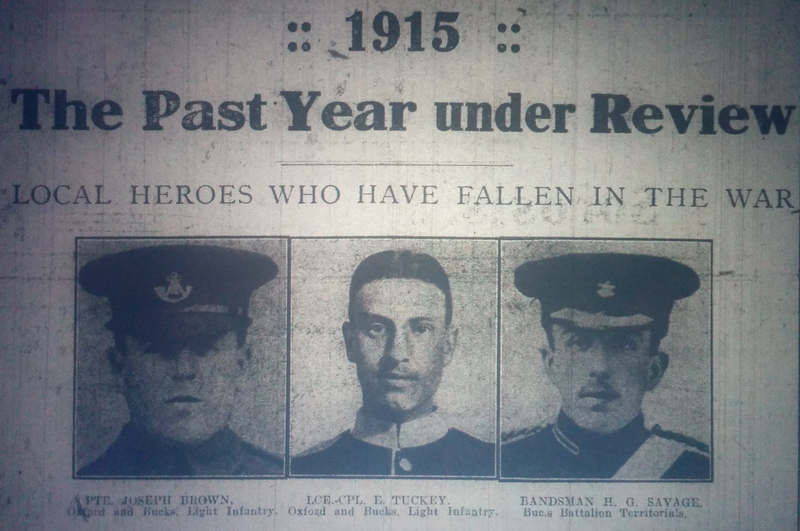 From left to right, Private Joseph Brown, Lance Corporal E Tuckey and Bandsman H G Savage. From The Wolverton Express, January 7th 1916.
Notable amongst those papers serving the Milton Keynes area was the weekly Wolverton Express and The Bucks Standard, and though these particular publications have not yet joined the hundreds already available to fully search online, it is still perfectly possible to see what was happening in Wolverton and surrounding towns and villages by visiting Central Milton Keynes library. Here you will find microfiche copies of these papers, which while a little challenging to search (library staff are of course on hand to help), can provide some amazing surprises, especially if you know or suspect that a family ancestor served in the war. Scanning through these fascinating old pages, with local news of flower shows and weddings interspaced with bulletins from the war, you can be lost in the past for hours, but before you visit the library, there is a useful resource you can first visit online to help narrow your search. The MK Heritage website is home to an enormous archive of information on the history of Milton Keynes, and here you will find transcribed the letters sent home by servicemen to parents, wives and other relatives and friends, or in darker circumstances, received in the event of a wound received, a man missing or captured, or most feared of all, a fatality. This immense body of work, culled from a number of newspapers including The Wolverton Express and Bucks Standard, (where letters were often published) is the diligent work of local historian John Taylor. Should you wish, as well as the online version, a bound hard-copy is also available in the reference library at Central Milton Keynes, but however you choose to read them, these missives from the front line offer an incredibly poignant insight into the vicissitudes of wartime life. Remember though that these letters are just a small fraction of the information locked up in these old newspapers, and finding an original article, especially if there is a personal connection, is well worth the effort. Here then are two examples of letters published during the war years. This posthumous letter, heavy with portents, was found in the pay book of Private Arthur Kitchener after he died of Pneumonia in France. Arthur was a resident of Wolverton, and like many soldiers who enlisted in the area, was an employee of Wolverton Railway Works. By contrast, here is an extraordinary account of a lucky escape by a Private Lancaster of Stony Stratford. The “Coal Box” that Private Lancaster refers was slang for a high explosive shell which produced a great deal of black smoke. However, while these transcripts are immensely interesting, they do not always provide, literally speaking, the full picture. This is because it was very common for newly enlisted soldiers to have a photograph taken prior to their departure on active service, often by a professional photographer in a studio, and sadly these haunting images would sometimes find their way into a local newspaper in the event of a soldier’s death. A Roll of Honour section is to be found frequently in wartime papers, and while it is not always the case that a photograph is used, it is certainly worth checking the original pages if you suspect a relative is featured. Here are a few photographs and brief information on the soldier featured. Private C. J. Harris, of the 1st Bucks Territorials, 145th Machine Gun Co., was killed in action in France on August 14th. He was aged 20. He was the only son of Mr. and Mrs. George Harris, of Church Street, Wolverton. Photographs could also be published in happier circumstances. 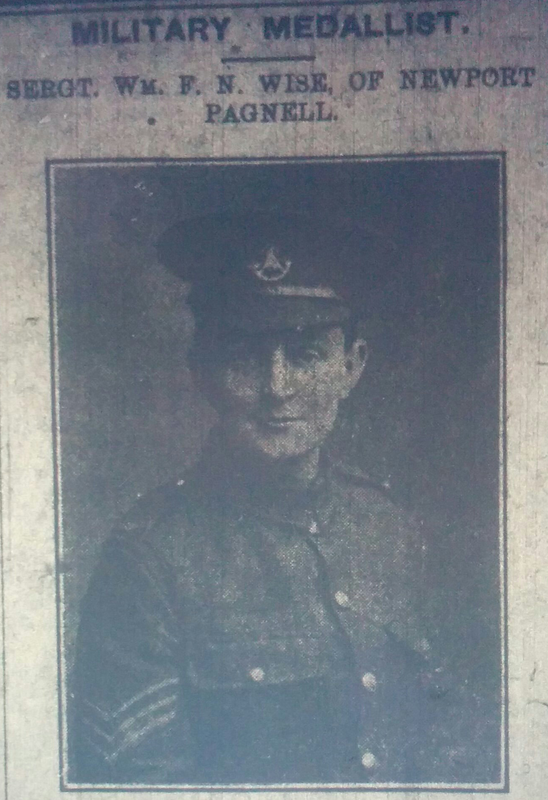 Sergeant William Wise of Newport Pagnell, formally a carriage builder at Wolverton Works, was awarded the Military Medal for Gallantry, after he volunteered to deliver a vital message under very heavy fire. Later that year, he was seriously wounded, but survived and went on to marry a Lilian Cousins, also of Newport Pagnell. It really is only right and proper that these stories and photographs can still be retrieved, so if you have the opportunity, do take a look for yourself, and if you happen to find someone from your family, why not share your discovery in the comments section below. 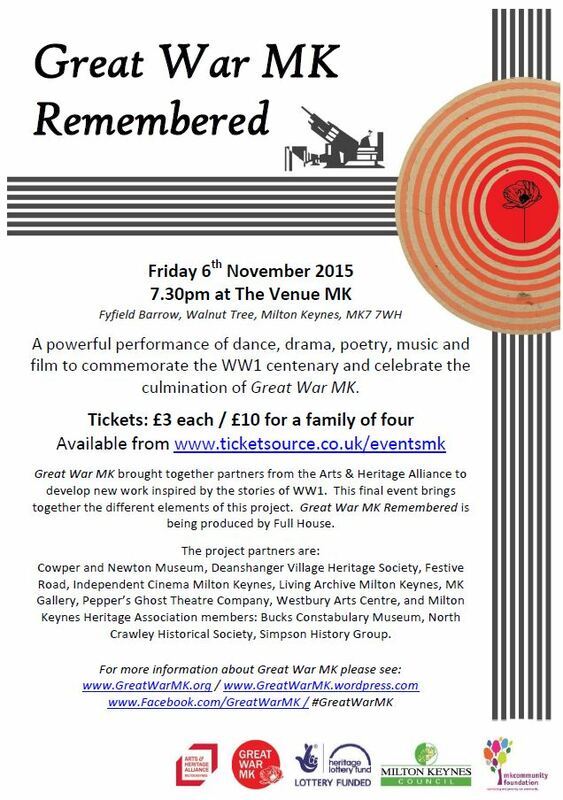 Alternatively, you can also contribute to the Great War Memories of Milton Keynes website.